Although it’ll be a tough ask to follow in the footsteps of past Real Madrid star left-backs like Roberto Carlos and Marcelo, Sergio Reguilon’s impressive recent form with Los Merengues has him on the right path. Having bided his time playing in Real Madrid Castilla and during loan spells with UD Logrones, the man who joined Los Blancos’ youth setup back in 2005 is finally now being rewarded for all his patience, persistence and hard work. Despite making his professional debut back on the 2nd of October last year vs. CSKA Moscow in the Champions League under Julen Lopetegui’s guidance, he’s really began to flourish under his replacement Santiago Solari. Even though Marcelo initially remained first choice, Reguilon’s really taken his opportunities with both hands since the turn of the year, adding greater balance and defensive solidity than the marauding Brazilian. Knowing each other well from their time working together with the Castilla team, Solari’s shown great belief and trust in the 22-year-old full-back, which has been illustrated by Solari handling him starts in five of Madrid’s last six matches. Given the nod in key matches against Ajax in the Champions League, Sevilla, Real Betis, Espanyol, Alaves and the derby with Atletico Madrid (which were all wins), Reguilon’s emphatically repaid his manager’s faith with his consistently strong displays. Looking right at home at the senior level, he’s hardly put a foot wrong, as the starting spot now looks his to lose. Defending with intelligence, athleticism and intensity, he’s proved a stubborn adversary for his opponents to get the better of. Tracking his runners vigorously, he monitors their movement closely and reacts quickly whenever they go. Aided by his awareness, excellent judgement and pace, he’s been wide awake to their runs in behind or when they drop deep. 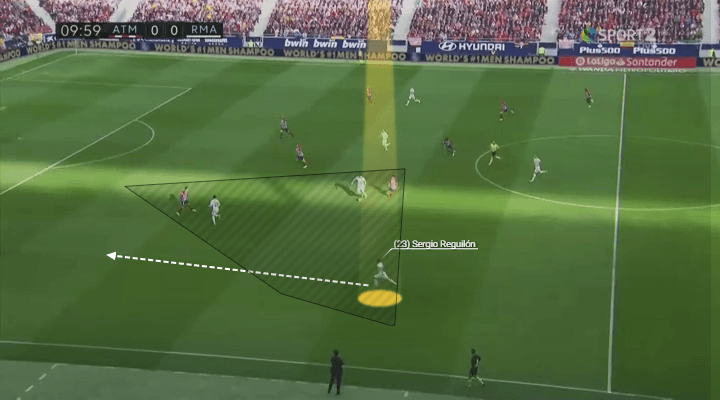 In addition, his covering speed has been important when a teammate needs support or he needs to jet back when the opposition is counter attacking. Pressing with tenacity and smarts, he responds quickly to triggers, such as his man receiving back to goal, in an open body shape or when an underhit pass is played to his foes. Then, when it’s come to applying his challenges, the long limbed youngster has executed his interventions with notable timing to win back possession cleanly. Equally adept in aerial duels, his bravery, strong leap and timing has ensured he holds his own in such battles. Demonstrating sound judgement in his positioning, knowledge when to shift across, step up or back, he’s kept his shape well to maintain horizontal compactness with his defensive comrades too. While he’s not as eye-catching going forward as Marcelo, his attacking contribution has still been very valuable indeed. Technically proficient and competent with the ball at his feet, his dynamic dribbles forward and coherent passing have been key positives. Always on the lookout to drive at defenders, once getting the ball under control with his neat first touch, his eagerness to surge forward has been a joy to watch. In terms of his distribution, the way he’s passed the ball around concisely in build-up, combined tidily in wide areas, crossed decently and hit searing switches of play have been highlights. Tying the afore together with the clever timing of his runs, he’s done a fine job of stretching his opposition vertically and horizontally with his shrewd upfield bursts, plus created numerical superiorities out wide and underlapped when his winger pushes wide. Already developing a solid understanding with his colleagues, as his cunning rotations and nous to cover their runs when required show, expect him to only enhance his impact over time. Statistically speaking his 3.79 interceptions pg, 1.71 clearances pg, 15.83 forward passes pg at 84.1%, overall 87.2 % pass completion from 57.86 attempted passes pg, decent 1.10 accurate crosses pg, 1.96 dribbles pg and 1.28 touches in the box pg only accentuate his valuable contribution. Getting the fundamentals spot on defensively and full of promise offensively, Reguilon’s emergence has unquestionably been one of the highlights of Madrid’s mixed season so far. With Reguilon giving them stability and more balance, Real Madrid have won all six of the matches he’s started this year. Settling in wonderfully to life playing for the reigning European and World Champions, and dealing admirably with all the pressure that comes with playing for Madrid, the Spaniard’s formidable attitude and quality have shone through. After all that toiling away to get to the top, Reguilon’s certainly earned his chance at the highest level, as his future looks to be an incredibly bright one. These reasons are enough for Santiago Solari to know that Sergio Reguilon is worth the switch from his veteran Marcelo. Discover an easy way to bet with the best prices and massive limits, check out our hassle-free Skype Betting at custserve01 today or visit VOdds now!